The Bermuda Triangle is well known, but rarely do you hear about the other Triangle where strange things are said to happen: The Devil's Sea, sometimes known as the Dragon's Triangle. This Devil's Sea is bounded by the south-coast of Japan, the northern tip of the Philippines and Guam. Boats have gone missing in this area and there is a history stretching back to ancient times. 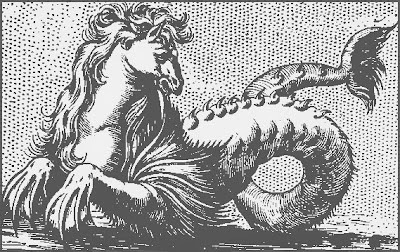 When I was doing a little research on this I found that there is supposedly a striking coincidence between the Devil's Sea and the more famous Bermuda Triangle. The Bermuda Triangle includes, almost at its western terminus, longitude 80 degrees west, a line where true north and magnetic north become aligned with no variation in compass readings. So what sort of recorded happenings is the Devil's Sea known for? In 1954 the Japanese government is reported to have sent out a research vessel, the Kaio Maru No. 5, to investigate the mysteries of the Devil’s Sea. The Kaio Maru No. 5, and its crew of 31 people, were never seen again. According to Charles Berlitz's book The Dragon's Triangle in the 1950s Japan lost five military vessels and their crews, totalling over 700 people, within the area. It was officially declared a danger zone. If we look at ancient legends they tell of how dragons lived off the coast of Japan. This is how it became known to some as the Dragon's Triangle. "On February 22 in 1803, local fishers ... in the Hitachi province saw an ominous 'ship' drifting in the waters. Curious, they towed the vessel back to land ... The upper part had several windows made of glass or crystal, covered with bars ... The windows were completely transparent and the baffled fishermen looked inside. 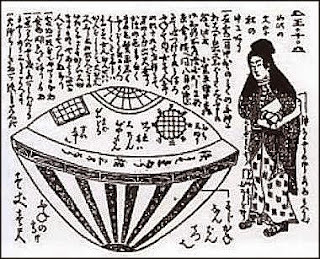 The inner side of the Utsuro-bune was decorated with texts written in an unknown language. ...Then the fishermen saw a beautiful young woman, possibly 18 or 20 years old. Her body size was said to be 1.5 metres (4.93 feet). The woman had red hair and eyebrows, the hair elongated by artificial white extensions ... This hair style cannot be found in any literature. The skin of the lady was a very pale pink colour. She wore precious, long and smooth clothes of unknown fabrics. The woman began speaking, but no one understood her. She did not seem to understand the fishermen either, so no one could ask her about her origin. Although the mysterious woman appeared friendly and courteous, she acted oddly, for she always clutched a quadratic box made of pale material ...The woman did not allow anyone to touch the box, no matter how kindly or pressingly the witnesses asked. ... 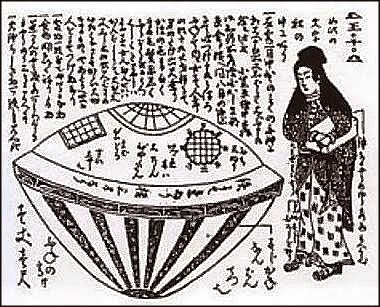 The fishermen reassembled the Utsuro-bune, placed the woman in it, and set it to drift away into the ocean." So very briefly, that is the Devil's Sea or Dragon's Triangle. What an intriguing story about the woman in the Hitachi province! The oceans certainly have their own secrets! I have never heard of this before although I have certainly heard of the Bermuda Triangle. I have read so much about it too. A big mystery, as it appears, so is the Devil's Sea. Fascinating stuff Mike.